When a cartoonist begins making a comic strip, questions of how to give visual form to narratives expressed in text, or lurking as-yet-unrealised in cognition, form a central part of the decision-making process. What imagery would best depict the essence of the story I want to tell? And how can I organise that imagery into a flowing structure that is at once unified and multiple? These questions cannot, in any meaningful way, be separated ' in comics, visual form and narrative content constantly inform and imply one another. But what could be revealed about the process of visual storytelling if an attempt were made to perform that separation? 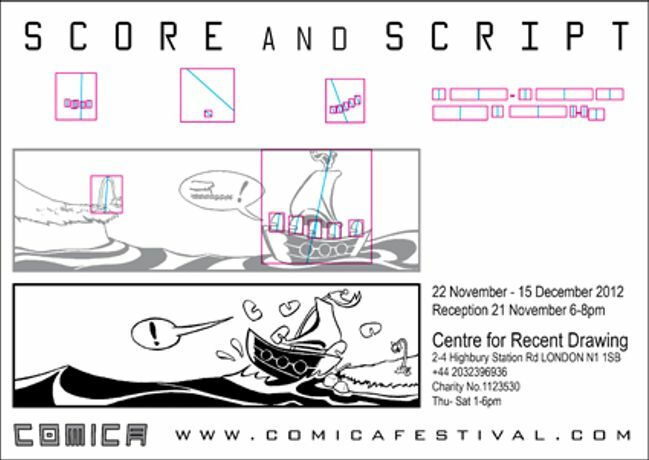 Cartoonist and PhD researcher John Miers created a single-page comic, from which he derived two descriptive texts: The script, a verbal account of the events depicted in the comic, with all visual detail excised, and the score, a diagram showing the dimensions and location of depicted narrative actors, with no information regarding the narrative content. 30 of the UK's best cartoonists are creating their own single-page comic in response to one of those descriptions, with 15 working from the score, and 15 from the script. This exhibition presents the first set of results from this project. While examples of comic scripts and their realisation as drawn narratives are not difficult to find, the opportunity to examine a range of responses to a single starting point is rare, and the chance this project offers to examine the relationship between visual structure and narrative content is unique.